Americans experienced scattered delays at US polling places in about a dozen states, largely in sites still using ageing voting machines that were overwhelmed by a surge in voter turnout, according to officials and voter rights groups. The US Department of Homeland Security described the problems as "sparse," and an official told reporters they did not seem to have been a significant impediment to voting. At least one case, in Arizona, which was home to hotly contested races for the US House of Representatives and Senate, triggered a lawsuit aimed at extending voting hours at polling places that opened late due to mechanical difficulties. Some Georgia voters saw queues of hundreds of people waiting to cast ballots in an election that will determine control of both houses of Congress and three dozen governor's seats. Georgians were picking their next governor following a tight, bitter race in the southern state. Two senior legal experts who advise the Democratic Party told Reuters they were unaware of any serious hacking or electronic disruptions related to the midterms anywhere in the United States. But one of the experts said that queues at polling places in Georgia were long and disruptive. Officials in Philadelphia and North Carolina reported scattered voting machine outages, and addressed the problems by offering provisional ballots to some voters. Voter advocacy groups alleged equipment-driven delays in Florida and Texas. 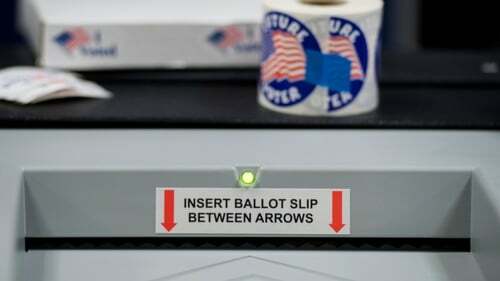 Delays appeared to be most common in states with ageing voting machines, said Lawrence Norden, deputy director of the Democracy Program at New York University's Brennan Centre for Justice. Broken voting machines were reported in at least 12 states, according to an "election protection" coalition of more than 100 groups that set up a national hotline for reporting irregularities. In Maricopa County, Arizona, which includes the Phoenix area, several polling places experienced delays due to printer malfunctions, County Recorder Adrian Fontes said. A civil rights group has sued the county government in an effort to extend voting by two hours at polling locations that experienced delays. The technological glitches and printing problems affected 50 polling locations in Arizona’s largest county, according to the Lawyers' Committee for Civil Rights Under Law, which filed the lawsuit in state court in Arizona. In Georgia, the state sent investigators to look into problems with digital poll books, said state spokeswoman Candice Broce. Some voters were given provisional ballots instead of using regular voting machines, she said. One woman said technical problems caused her to wait more than four hours at a polling station in Snellville, Georgia, to cast her ballot. Civil rights groups have already been locked in litigation with several states over voting restrictions that were passed in the lead-up to the election. Each of those hotly contested states' top election officials have said the changes were made to protect against voter fraud and accommodate budgetary constraints, not to suppress voting.